Our nightmare started as a bad dream. 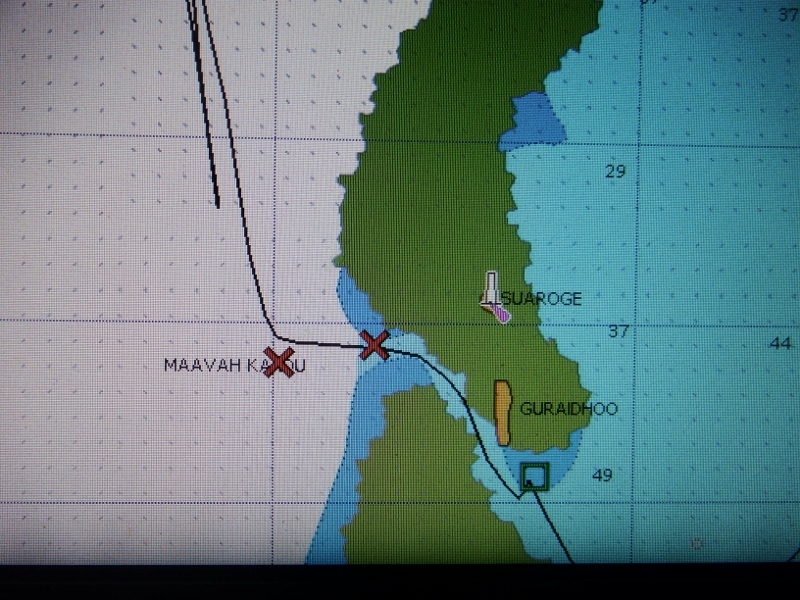 We arrived at the entrance to Maavah Kandu at midday after a 4 hour sail from Veymandhoo to find squalls on our path. One of the things essential for entering passes is good light to see the reefs either side. So we hovered for an hour to allow them to pass. This was the time the sun canopy chose to come apart at the seam literally. We shouldn’t have had it up but it was rolled away as quickly as we could. Unfortunately some more squalls were advancing from behind us so we just had to go in. The entrance to the pass is at 01 54.85N 073 14.62E. It’s an easy entrance with a big beacon marking it and the reef could be seen clearly on both sides, even in the bad light. We made our way inside. The first thing we saw were 6 big local fishing boats, always a good sign if the local boats are sheltering in an anchorage. 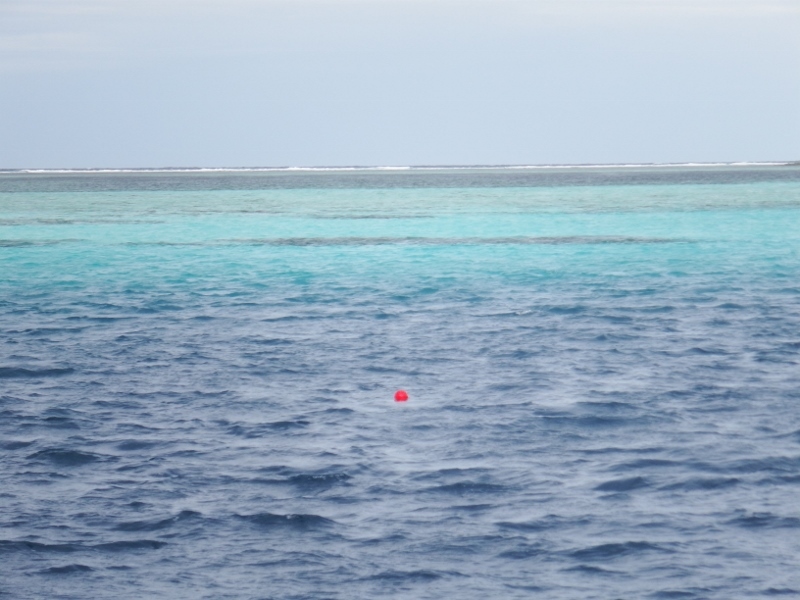 We motored south passed the village to the reef on the western side of the atoll. The wind was blowing strongly from the west but it was calm inside. We had a waypoint from a yacht that came through here last year. We went to it but it was in 30 metres. 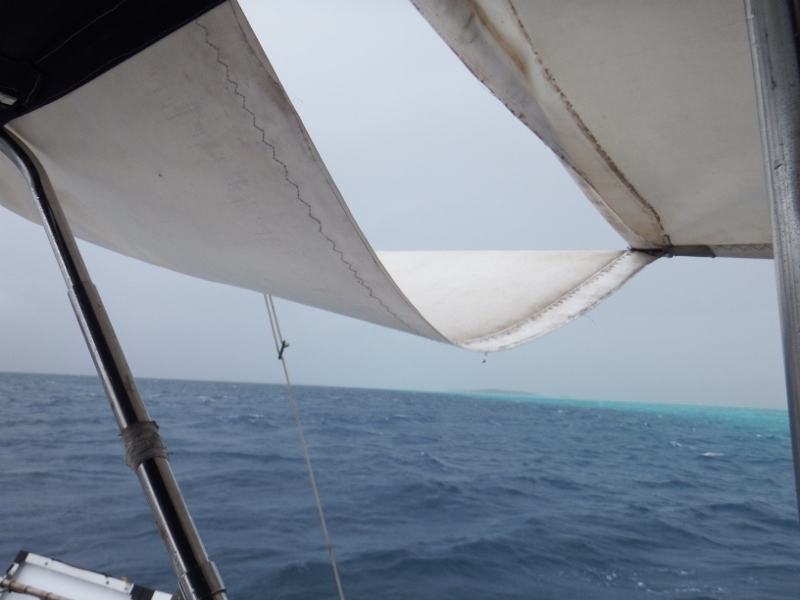 We motored towards the reef and dropped the anchor on a sandy reef shelf in 10 metres and fell back. The anchor pulled out. 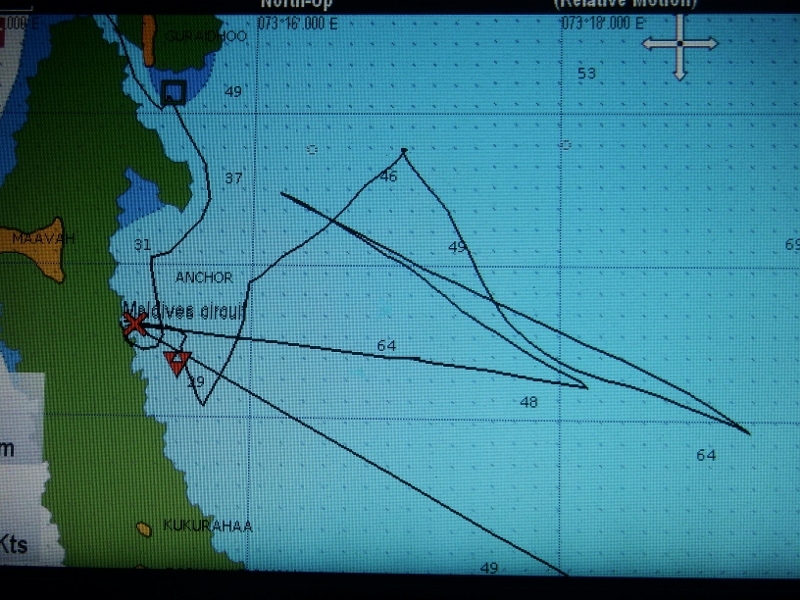 We made a second attempt this time going closer and dropped the anchor in 5 metres and fell back into 15 meters. This is NOT the way we like to anchor but we had no choice, we couldn’t go back outside and the light wasn’t good enough to travel through the atoll to see what we could find. This time it held well but Bill put out all of our 60 metre chain to allow for the sloped drop off. We could see coral heads dotted around the sandy reef top and Bill took the dinghy over to have a closer look. The nearest was in our swinging area and only had about a metre clearance, we draw 2 metres. We worked out that even if the wind shifted due north in a squall we would still have a comfortable margin of safety. The alternative seemed to be motoring in circles all night. 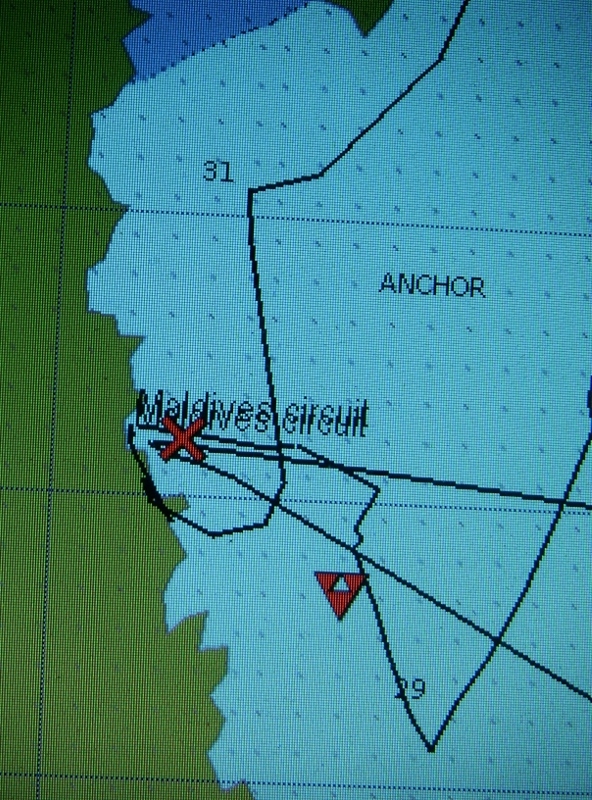 Mistake no 1, we should have moved but the anchor was holding this time so we stayed. All was well the wind was dropping. Bill had the clever idea of marking the reef so we could keep an eye on it in the dark and took an orange buoy with some reflective tape tied to a bit of fishing line with a bit of chain on the bottom, over to it. We had the depth alarm set at 3 metres and the drag alarm set at 0.02nm. We settled in for the night and ate our dinner. Things started going wrong at about 9 ish. The wind started swinging around to the NW and it started raining. When shining a torch on the buoy we could see we had got closer to it. Within half an hour the depth alarm started going off because the wind had picked up and was now coming from the north. 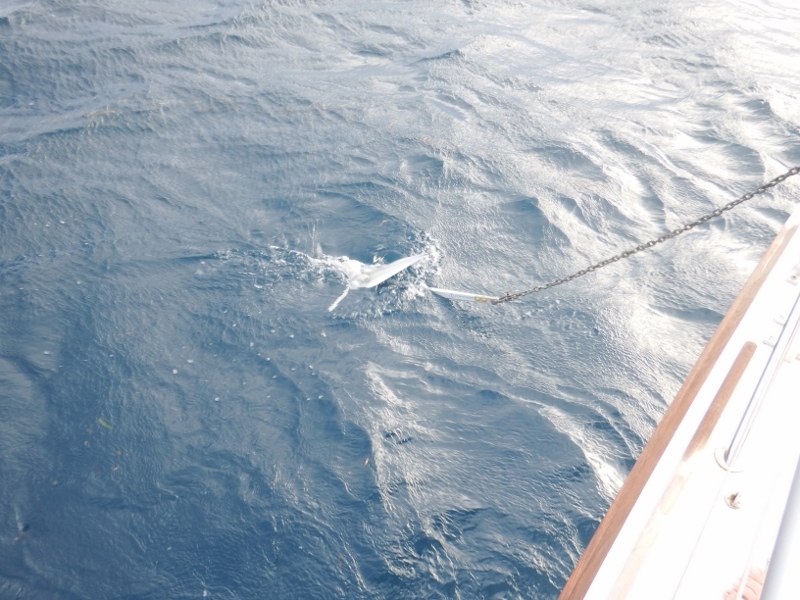 We decided to put a stern anchor out on our starboard side to pull us away from the reef. It took a while but we managed it in the dark. Bill took the dinghy round to the port side to push us off while I winched the anchor warp in. We were back in 5 metres, not good but not bad. Then the bad started. The wind veered round to the NE and picked up to 20 to 25 kts. The bad dream was turning into a nightmare. With the position the boat was now in that meant it was blowing onto our starboard beam and we were pinned onto the sand shelf with the reef a few meters away with 2 or less metres under our keel. The depth alarm kept going off so I turned it off because it was very distracting, I also turned the drag alarm off because we weren’t dragging. We waited about 20 minutes to see if it was going to drop but it didn’t. The wind was now blowing 27kts solidly from the NE and the sea was swiftly getting into a serious chop which bashed the starboard side of the boat making it jiggle which stressed both the anchors to the point that if it continued they were likely to let go. Bill was looking worried – not a good sign on our boat. We tried to decide what to do. Bill said ‘I’m prepared to lose the stern anchor but I’m not prepared to lose the boat’. We had to act quickly. A buoy was tied to the stern anchor. Bill started the engine although, as we were pinned to the sand shelf by the ever increasing wind, it was of little use unless we could move sideways and we don’t have bow thrusters. An additional problem was because all the chain was out of the locker I was needed in the forward cabin to poke it down otherwise it would jam and that was the last thing we needed. The plan was I would drop the stern anchor and quickly run inside while Bill started taking up the anchor chain (he has a remote control in the cockpit). During all this the anchor hadn’t budged, we weren’t dragged, Bill intended to motor forward toward the anchor as the chain was being raised, allowing Camomile to drift further onto the sand shelf in front of the coral head. With the chain two thirds in we would then stop raising it before it took us too far over the reef and power hard forward right using our starboard propwash to perform a tight turn and drag the rest of the chain and the anchor off the shelf and into deeper water away from the reef where we could continue raising it. It was dark, it was raining and it was risky because we didn’t know how shallow the sand shelf was or if there were any more bommies further forward, but we had no choice. With the wind increasing we needed to act quickly or Camomile would be lost. So with adrenalin pumping that’s what we did. The stern anchor fell away quickly and Bill started immediately to lift the anchor, I ran through the boat to start the job of poking down the chain, AARRGG the chain jammed half way up because it was straining so badly. If the fuse blew at this point it would be game over! Bill was pushing the up button, then the down, then the up, I was yanking it from below and managed to free it. 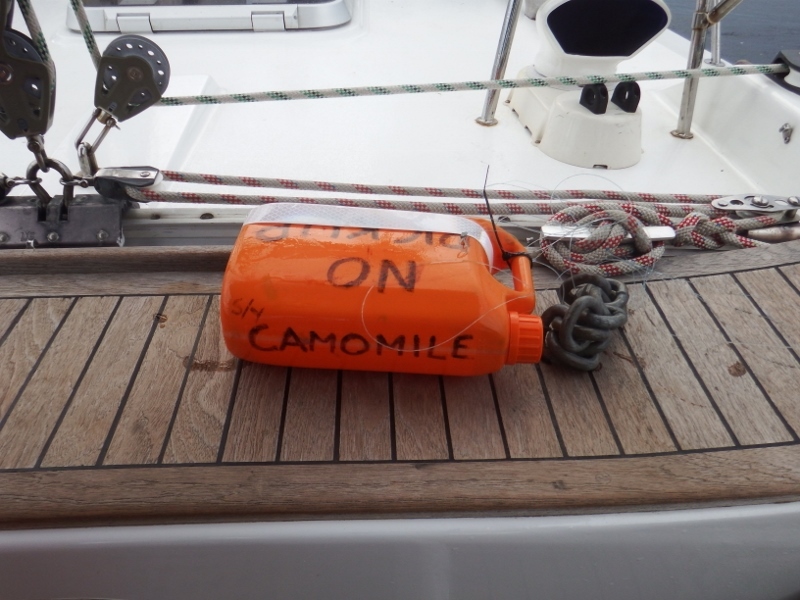 Camomile swung into less than half a metre under her keel but thankfully there weren’t any bommies there and she motored forward dragging the anchor off the shelf with her and the rest of the chain was brought up. Phew. We did it! High fives all round. I was shaking like a leaf. We were in deep water but the problem wasn’t over, what do we do now? We both thought of going back out the way we came in but the wind was now a steady 27 kts coming right into the entrance. We could hear the waves crashing onto the reef on the other side. To go out would be madness, we weren’t ready for a deep sea trip. The next atoll was an overnighter. We also still had the dinghy down which was thrashing around dangerously on the stern. We motored out into 50 metres fairly sure there weren’t any reefs in the area so we could lift the dinghy onto the davits. It was too rough for Bill to do it his usual way of getting in the dinghy, attaching the davit wires while I winch them up. He managed to get the stern wire on while I held the bow in with the painter, and start lifting it. Then while kneeling on the bathing platform he managed to get the forward wire on and lifted that up too. Then we both winched one end each once it was out of the water. During this whole operation it was still raining we were both soaked and, for the first time for months, feeling cold. All of this had taken about 2 hours and it was now 11pm. Bill decided to motor slowly up wind in an area we knew to be free from reefs having checked Navionics, google earth and Bing, which took about an hour. Then the engine was turned off and we hove to under bare poles gently drifting back through the deep water at just over 1 knot. 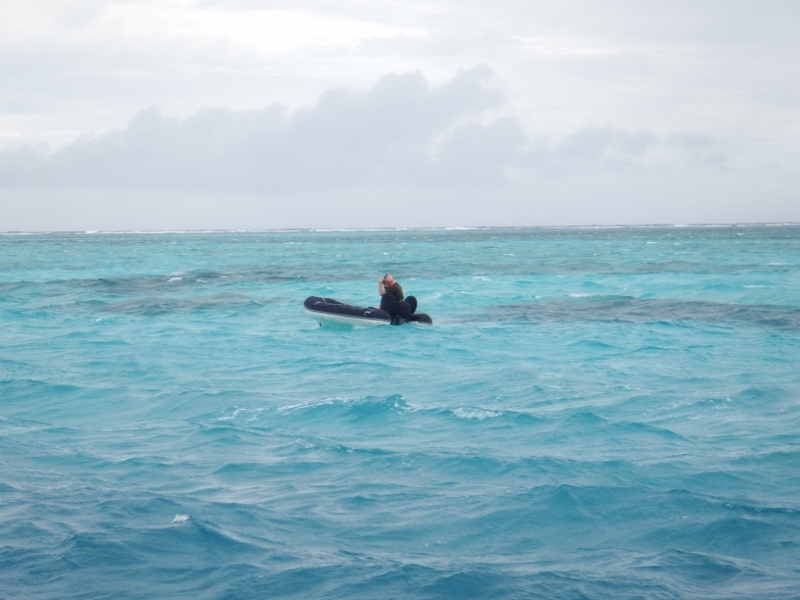 The boat was stable in the local chop and still being inside the reef there was no swell. We drifted 4 miles in a line we knew to be safe then turned round and did it again. It was our only option there was no where else to anchor that was not a reef or 40 meters deep. We took it in turns to cat nap but neither of us could sleep properly. Ironically the wind had started dropping and gone back round to the west but we made the right call. If we’d stayed there we would have lost the boat. At daybreak we motored back to our anchoring spot to see if we could recover the stern anchor. 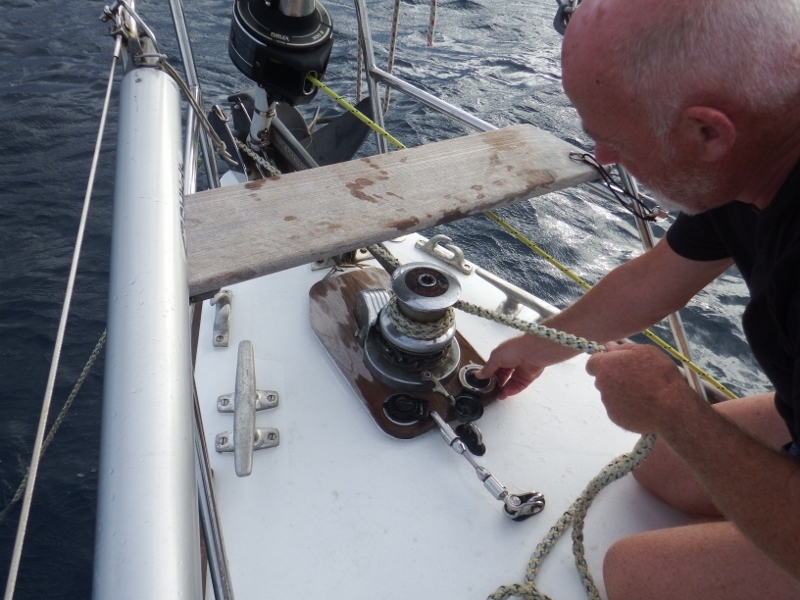 Amazingly it was still attached to the red buoy and we managed to lift it back on board on the windlass. The final event was as we were motoring out of the area we noticed an orange buoy in the water with reflective tape wrapped round it, there was the float that Bill had marked the reef with that had floated away! I picked it up with the boat hook. So everything present and correct. Another one of Camomiles nine lives used up.